Weekly Update #278: 2019 IPO Outlook: A Bellwether Year for the New Tech Elite? This week's content is brought to you by Adam Augusiak-Boro. Chart of the Week – 2019 IPO Outlook: A Bellwether Year for the New Tech Elite? As the bull market charged into its ninth year in 2018, with the FAANG tech giants (Facebook, Apple, Amazon, Netflix and Alphabet’s Google) leading U.S. equities markets to record highs, many of us thought we would have seen stronger IPO activity. 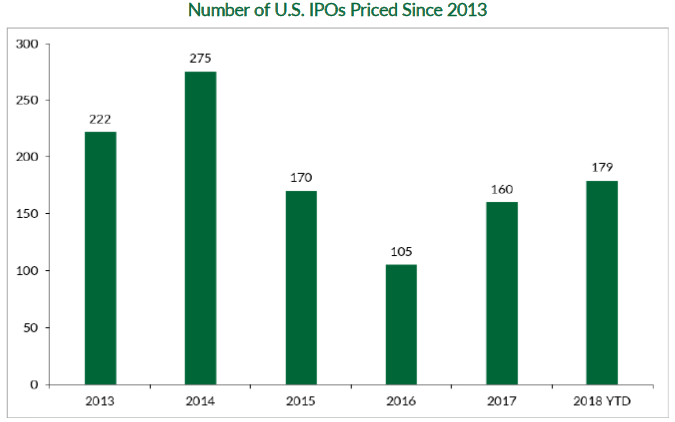 However, with under two months left of 2018 and despite favorable market conditions (recent market volatility aside), this year’s U.S. IPO count is still nearly 100 IPOs lower than 2014’s total of 275 priced IPOs. At EquityZen, we continue to believe that IPO volume will remain subdued compared to prior bull markets given the secular trends we see in the U.S. capital markets. Namely, private capital (accompanied by record high valuations) continues to flood the venture-backed ecosystem, allowing tech companies to stay private longer by greatly reducing the need for public capital. While 2018 did not set a record for IPOs, it was the year of the “SoftBank IPO” as the Japanese giant led financing rounds at U.S. companies totaling almost $8 billion, according to Crunchbase. Through its $100 billion Vision Fund, SoftBank essentially established itself as the central bank of venture capital, seemingly printing money for circulation among the elite corporate institutions, except Fed Chairman Jerome Powell is SoftBank CEO Masayoshi Son and Wall Street titan JPMorgan is ride-hailing giant Uber. Even if recent news out of Saudi Arabia, a major backer of the Vision Fund, curtails SoftBank’s spending, the rise of mega funds is not purely a SoftBank phenomenon. Since 2014, the average venture capital fund size in the U.S. has increased from $161 million to $283 million. Additional factors contributing to the tepid IPO environment in recent years include the high regulatory costs of becoming—and remaining—a public company, equity analyst scrutiny, and an increase in liquidity alternatives, such as the EquityZen platform. We believe these factors will continue to weigh on IPO volume into 2019 and the years ahead. Nevertheless, 2019 may be one of the most highly anticipated IPO seasons in recent memory, with potentially blockbuster IPOs from Uber, Lyft, and Palantir among the 15+ tech startups we believe are ready to join the public ranks. Our projection is based on a bottoms-up analysis, starting with a list of nearly 130 of the largest VC-backed unicorns in the U.S. We then use a combination of quantitative and qualitative factors that have historically presaged an S-1 filing to determine IPO readiness. After taking billions in capital, will the new tech elite impress the public? Since their founding, the top-20 most valuable private tech companies in the U.S.—which include Uber, Airbnb, Lyft, and Palantir—have received over $65.2 billion in private capital. With 2019 approaching, next year’s IPO season may finally shed light on whether this massive influx of private capital into the tech industry has been well spent. We dig further into these bellwether IPOs in our 2019 IPO Outlook. Click here to read the full report. For additional commentary on our 2019 IPO Outlook, click here to see EquityZen CEO Atish Davda speak with Yahoo! Finance on what we can expect next year. DraftKings - DraftKings Raises $150 Million Before NFL Season: What Does It Mean For DK, And Daily Fantasy Sports?